Participants in the first ever liveART event. You can go to any art gallery to see art and listen to jazz music, but how often is it that you get to see the work being created? liveART3 at The State Theatre will consist of a dozen area visual artists, each of whom is allotted an eight-by-eight foot “studio” where they will spend the day creating art – from start to finish – live before your eyes. In years past the event included potters, painters, glass blowers, metal smiths, quilters, wood workers, and even ice sculptures. 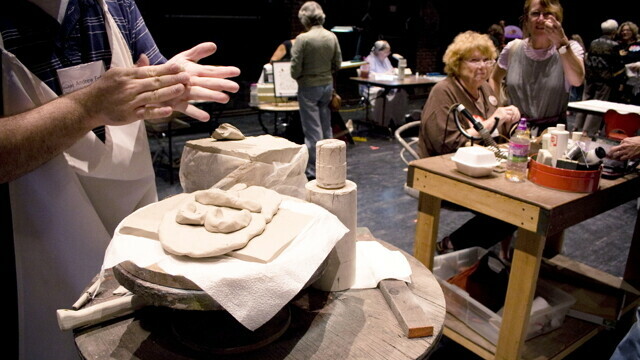 Whether they wield paintbrushes, markers, fire, water, chisels, throw clay, or use found objects, local artists will be plying their trade right on the stage. Some of this year’s big names include potter David Caradori, sculpture Mel Sundby, graphic designer Lori Chilefone, painter William Schulman, and water media artist Pat Hamm. The purpose of the event is to allow attendees to walk amongst the art, chat with an artist, and watch the creative process that goes into each piece – and maybe even take a piece home with you! Each piece will be sold in a silent auction format, meaning patrons can bid on a piece before it’s even finished. All proceeds from the event will go directly to benefit The Janet Carson Gallery. The State Theatre will also have different “make your own” art opportunities throughout the building, some aimed the children, others for all ages, as well as food and live jazz music.